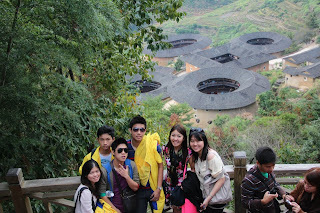 "Tulou, meaning earth building (Hakka Villages), is the most extraordinary type of Chinese Hakka's rural dwellings in the mountainous areas of Fujian, in south China. Escaping from the war and disaster, the Hakka were originally moved there from northern China since 12th century. They settled down in Fujian province and developed groups and groups of the unique earth building between the 12th to the 20th centuries." "A Tulou is usually a large, enclosed and fortified earth building. With a round or square configuration, it is designed as a solid fortress for the Hakkas' living and safety in the area of undesirable mountains. The building, usually from three to five stories, is constructed by very thick load-bearing rammed earth walls. The outer walls are formed by compacting earth with stone, bamboo pieces, wood block and other readily-available materials and are thick up to six feet (≈2m). The reinforced outer structure are protective for wind and earthquake and make a well-ventilated environment cool in summer and in winter." Such a huge and healthy chicken! spotted Chatime and Bench Body in China. ohhh Jake Cuenca! Night market closes at 11pm sooo after walking around, went back to the hotel to take a rest. Knock out from a whole day walk.